Toke and Save the World! I have never been a dude or with one, so a language with swearing more than speaking doesn’t go that well with me. None of the guys with whom I grew up learning and playing speak that way. Even very few, in fact just one in my extended closer circle, who toke – speak the stoned language talked about in this book. So, as I started reading it, I found a sort of disinterest swelling up inside me. That grew up further as I had to try a bit to cope up with the speed with which the story was unfolding. I took some time to take the account of what all was happening, but after reaching the level of comfort, I started finding it easily able to push me to the next page as I approached the end of each page. 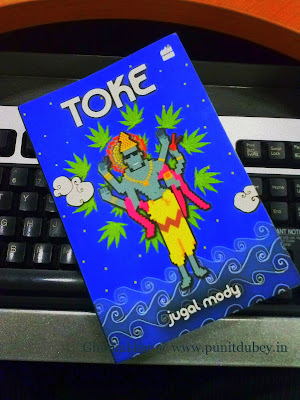 Toke is a book written by Jugal Mody, who believes in fiction and writes to feel like a dog sticking its head out the window of a moving car. Noun: The drawing of a puff from a cigarette or pipe, typically one containing marijuana. leave (actually being thrown out of office), Nikhil decides for Aman-Danny’s place and not his home. It would have been okay, but his decision to toke happens to be the start of a story that takes one on a roller-coaster ride meeting two of the Trimurtis, mythical and digital idols and saving earth and the Humanity just a few moments before it could have been a subject of wrath to Shiva. And, a parallel one sided-love story of Nikhil and Suparna, from HR. Professionally finding analogy is a part of my job role, so that comes instinctively to me even while looking at blank in a moment when I don’t think (don’t take that word by word please). After gaining interest in the book, I could think about relating the story with what is happening right now, mass producing intelligent, non-chaotic at, core professional keying in data and interpreting/solving on the pattern – this world would wouldn’t evolve but just get copied generation over generations. Author has tried defining chaos and its necessity for the evolution with the ease that may prove to be difficult to decode for someone or to some may define the core of progressive advancement. Use of Grass or Weed, for me, is little exaggerated; but anyhow it’s better and rather dependable to have used tea or something like that for the purpose. This is not much of spoiler, but still this part may kill the interest a reader may develop towards the end of the book. And, moreover this part is seriously what I adore. Complete fiction didn’t ended up the cliché Dream thing, like the alarmed cracked and the protagonist came back to normal world and realised whatever happened was just his/her dream. And there, being a lame writer myself, I appreciate Jugal, he actually concluded the story too well. I would prefer to copy-paste the introduction part, but let it be re-written. I wouldn’t say it’s a must read, deserves 3, 3.5 or 5 out of 5 stars (I am no good at that quantitative thing); but I can for sure say that I enjoyed reading the book. It’s of a different genre that I have not much read and I personally fought to read the first few pages but then when I was able to understand what I am reading, I THOROUGHLY ENJOYED IT! And, THAT MATTERS! And, special mention to the ‘…called Hinduism – it is, in fact the universal way of life, …’, I do believe in it.